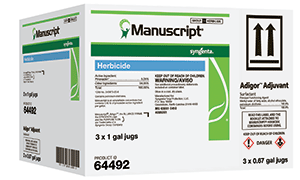 Syngenta launched a new herbicide called Manuscript. It’s designed to provide postemergence control of weeds, such as crabgrass and dallisgrass, in certain warm-season turf species on residential and commercial lawns, according to the company. Powered by the active ingredient pinoxaden, which features an advanced form of acetyl CoA carboxylase mode of action, Manuscript can be used at any time that weeds are actively growing. The herbicide includes a built-in safener that speeds the metabolism of pinoxaden and allows for effective spot treatments, Syngenta said. It’s packaged with Adigor surfactant from Syngenta, which is built for use with Manuscript for improved rainfastness, faster weed control and maximized quantity, rate of absorption of pinoxaden, and degree of translocation once pinoxaden is in the plant, the company said.